The Aastra 88-00004AUS-A is a bundle offering a single cell RFP SL35 IP fixed radio and Aastra 620d DECT phone handset. The SIP-DECT Lite provides a high quality, reliable wireless option for all users and is not tied to a specific desk phone model. It includes several cool features such as caller id/call waiting this way one can see who is calling before picking up the phone. It has a beautiful 2" color LCD display this way you can clearly read who is calling you. This handset allows you to be up to 150ft away from the base unit as well as the ability to talk up to 12 hours at a time. The Aastra SIP DECT Lite - 622 Bundle has many exciting features for users of all types. You can extend the lifetime of your Aastra SIP DECT Lite - 622 Bundle with the purchase of a FactoryOutletStore Factory Protection Plan. 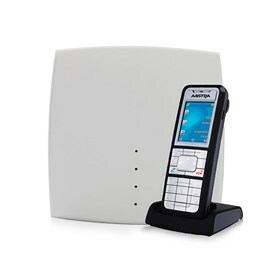 See the Aastra SIP DECT Lite - 622 Bundle gallery images above for more product views. The Aastra SIP DECT Lite - 622 Bundle is sold as a Brand New Unopened Item.